This month, we’re thrilled to bring back monthly reward cards! These all-new, exclusive cards come along once a month and are tied to your performance in the Ranked play mode. If you achieve rank nine or higher, you’ll earn one copy; rank five will give you the second, and you’ll earn a whole playset of the card if you’re able to make it to the elite ranks of rank one or Legend. October’s card is the first monthly reward coming from the Mage class: Altmer Dragonknight! 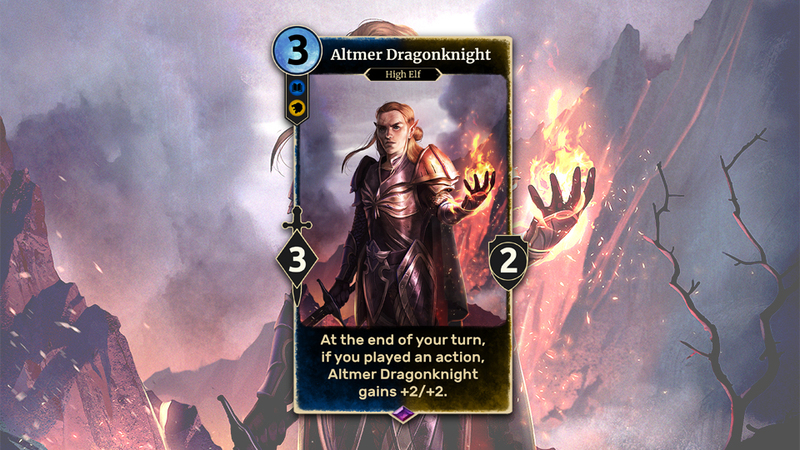 Altmer Dragonknight is a card with a lot of potential - but it will take the right deck-building skills to unlock it. Though the card starts out with modest 3/2 stats, it will grow by +2/+2 at the end of any turn in which you play in Action. This means if you’re able to keep Altmer Dragonknight alive long enough, it could truly become a force to be reckoned with! Altmer Dragonknight will be at its best in decks with a lot of Actions. Fortunately, the Mage class is known for its powerful Actions, so you’ll have no problem finding cards to pair your Dragonknights with. Cards like Lightning Bolt and Piercing Javelin will help you clear a path for your Dragonknight to attack while cheaper Actions such as Lesser Ward and Scouting Patrol can make sure it starts gaining power and health the turn you summon it. No matter how you decide to utilize Altmer Dragonknight, be sure to head into the Ranked ladder today to secure your copies!